Morning Favourites with Clinique. | By Millie. Over Christmas I was lucky enough to dive into the Clinique advent calendar. I discovered some amazing products, as well as rekindling my love with some old favourites. Two of the products in said calendar really wowed me, and I have now picked up the full-size and continue to love them. Before we go any further, this is not sponsored by Clinique, I've just been loving the brand, and these two products have secured themselves a spot in my morning routine! So, naturally, I had to share the love. I don't have a lot of time in the morning to spend on my skincare, so the products I do use I like to be super nourishing and truly work on my normal/dry skin. First off I want to discus the Pep-start Hydroblur Moisturiser. This is more like a moisturiser/primer hybrid which makes it a perfect base for makeup. I must say, it's not super hydrating, and as my skin sits more on the dryer side, I do need to use another moisturiser underneath in order to ensure my skin in nourished. You're probably now thinking, 'well why do you love it so much if it's not even that moisturising?' It's a fair question. The answer is because of the blurring properties this has. It's a magical product to smooth the skin and really blur out any imperfections and pores. That's what sold me, as I've never had a moisturiser that has that effect on my skin. It's a lightweight whipped consistency, so it sinks in really fast and doesn't leave my skin feeling too sticky. On really good skin days I can get away with just this, but for the most part it works best for me as a priming product layered over another moisturiser. 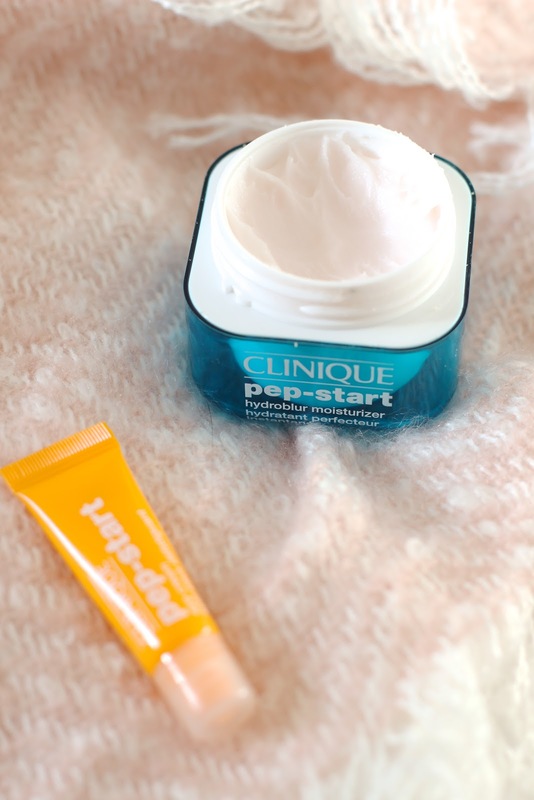 Another part of Clinique's pep-start range is their eye cream. This is packed full of vitamin C so is great in the morning for brightening and hydrating the under-eye area. You don't need a huge amount of this, a little goes a long way. I'm still going through the sample, but it's a very decent travel size, so a great way to try out the product. I'll definitely be purchasing the full-size once this is done. I'm only 21, so I'm not too fussed about eye-creams. As long as they brighten the under-eyes and can de-puff, I'm happy!